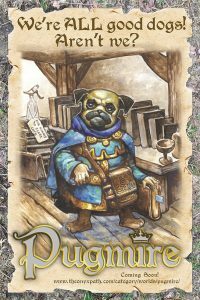 Pugmire Review – ARE YOU A GOOD DOG? No? (I’m not sure we can be friends) Even if you don’t like dogs, buy this book. Seriously. This will be the #1 RPG of 2017, hands down. I’m calling it now. You can go home other games. Now that is out of the way, let’s get into the review. Pugmire will be out this year, likely in a few short months. The final PDF is already in the hands of backers. If you would like to pre-order a physical copy, you can do that here. Buy it. If you buy no other book of any kind this year, buy this one. If you don’t think you’ll ever play it, I don’t care, buy it. That being said, this is the only RPG book that has ever made me cry. I love my dog. I love all the animals I’ve had as companions over the years and this book is filled with elements both cute, and touching. At the same time, it is a deep fantasy RPG that includes intrigue, horror, action-adventure, and practically any genre you could imagine. This could be Game of Thrones with Dogs if you wanted it to be. The animals in this book will remind you of Redwall, NIMH, CS Lewis’ work, and other deep works. Or, you could play a light-hearted game just as easily. 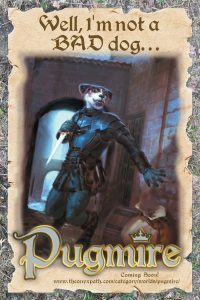 Pugmire is a fantasy RPG from Onyx Path Publishing, largely written by Eddy Webb. Full credits will be at the end of the review. Now, for those of you familiar with OPP you might be expecting the game to be a Storypath/Storyteller/d10 game. You’d be wrong in this case. 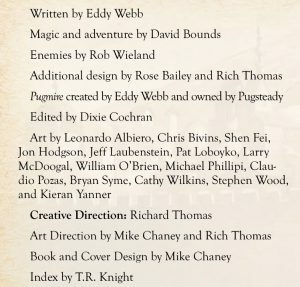 Pugmire is a gloss for D&D 5th edition. So, you’ll need a d20, and the rest of the standard array of dice you’d need for any D&D game. I’ll talk more about the system later. 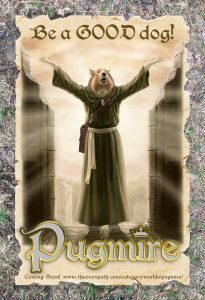 Pugmire is a medieval fantasy world, much like the Shannara series is a medieval fantasy world. That is, the game is a far-future post-apocalyptic world where Humanity as we know it no longer exists. Dogs, and other animals, were uplifted at some point in the distant past, and have struggled to survive and build a civilization in the wake of the disappearance of Man, also called The Old Ones. Mankind left behind troves of artifacts, which act as a source of ancient magic for Dogs. The core setting is Pugmire, a small castle city built atop a reclaimed swamp. The city has several tributary villages, and large towns, and is a decade out from a conflict with the Monarchies of Mau. Yes, Cats are here too, as are Badgers, Rats, and Lizards. Each of these societies is only briefly touched on in the Pugmire core-book, but Monarchies of Mau is already in production. Hopefully we will see the Rats and Lizards further examined, because I find their brief synopses compelling. You have two major choices in character creation. 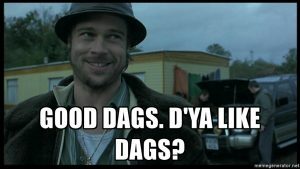 What breed of dog will you be, and what place do you have in society? The latter are called Callings and the former Breeds. The callings are Artisans (Wizards), Guardians (Fighters), Hunters (Rangers), Ratters (Rogues), Shepherds (Clerics), and Strays (Barbarians). These loosely correlate to the D&D classes noted in parentheses. Of particular interest, at least to me, are Shepherds and Artisans. Shepherds are part of the religious tradition that worships Man, and promulgate the Code of Man. The Code of Man is derived from recovered texts and artifacts. It exhorts Dogs to Be Good, Loyal, and to fight the Unseen, and more. Artisans collect the artifacts of Man, and use them to create magical effects. Both Callings are incredibly deep and offer nuanced options for players. There are 7 overarching Breeds. These are Companions (Pugs), Fettles (Bulldog), Herders (Corgi), Pointers (Labrador), Runners (Greyhound), Workers (Husky), and Mutts (Mutts). Each has an example of a modern dog breed associated with each in parentheses. These breeds are divided into family groups that match their breed to some degree, but the world of Pugmire offers a lot of freedom in these elements of character creation. 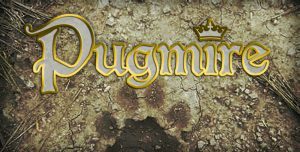 Pugmire uses a system based on the OGL license for 5th Edition Dungeons and Dragons. These mechanics are expertly explained in Pugmire. Character creation is straightforward, and it is easy to make a character in a very short amount of time. Mechanical discussions are well presented, thoroughly and expertly explained in the main text and asides are presented from a semi-in-character view. This is the most effectively explained RPG book I have ever read. This makes Pugmire an excellent starting point for new gamers of all ages. On top of that, there is enough crunch inherent to the system to make the most mechanic focused player happy. The mechanics and the story merge with each other in a way I don’t think I’ve ever seen before. I’m sure it isn’t perfect, but I personally don’t see any real flaws here. In fact, reading through this has made me understand some 5th edition mechanics in a way I wasn’t before. We, the players of this fine game, are provided a starting adventure at the end of the book, starting at page 200. This is a great module. Play it. Now, what other stories will you tell? This book is filled to the brim with story hooks, chronicle concepts, and threads that can keep you coming back for years. If Onyx Path collapsed the day we all get this book (I hope they don’t), we would still have decades of story to fall back on. If you would like a standard adventuring hook, we are provided with the Royal Pioneers of Pugmire, who are explorers and adventurers looking to recover the artifacts of Man. If you are interested in war, you can pit Dogs against Cats, or any of the other uplifted beings. As I’ve said before, there is enough here to run almost any genre of game. Also, there are the demonic Unseen stalking the world, seeking to destroy Dogs. In case you want some horror gaming to go along with your cute Pugs and Corgis wearing armor. Without a doubt, Pugmire is an inclusive game. It is easy to learn for young players, and deep enough for any grognard. Gender and sexuality are explicitly non-issues in the world of Pugmire. The world of Pugmire isn’t Utopia, there are inter-species conflicts and elements of discrimination and classism. These issues are presented to allow for deep introspection, if your group wants to explore them. Pugmire is an impressive game. May Man watch over you. Liked it? Take a second to support Josh on Patreon! Posted in Pugmire and tagged 5th Edition, Eddy Webb, Inclusive Gaming, Onyx Path Publishing, Pugmire.